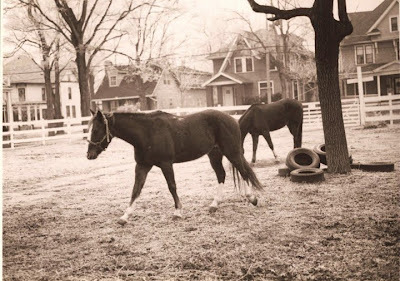 At last, the legendary John Kotarski has made contact and supplied a treasure trove of photos capturing a time when horses roamed the yards of Avon Street and the thoroughfares of downtown. I am enjoying the stories about this character called "John Kotarski." In fact, I recognise some of the tales myself. 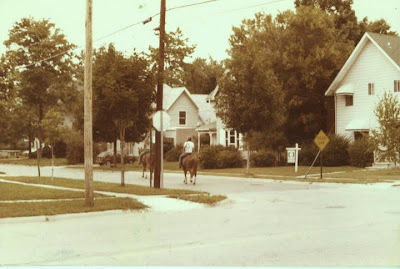 Tom Wirt provides photographic evidence that Flint is at least a one-horse town. That horse was mine before John bought him, and before me, it was owned by the family who had the stable and room for three horses in Flint. Another girl in the neighborhood, Michelle (I forget her last name) was also a co-owner of Alazon (a Mexican Creole and former race horse). It's a strange and wild story, the family who owned the property was definitely not your Ozzie and Harriet variety. And the old man was an exhibitionist who lived to wear next to nothing claiming it helped him "breathe" since he had emphysema. He was an odd and basically harmless guy. But you could still have a horse in the city at that time and teen girls flocked to that stable. I'm sure the clause is no longer in effect, because once the horses were gone, the clause would be void. We lived a block away from John, who was a friend of my family's. I was relieved when he bought Alazon, I had already moved away to college. But then john told me Alazon was kicked by another horse in the paddock where he boarded him and this shattered a front leg, which could not be repaired. A sad way to go for a strong horse. I have to admit I was always a little skeptical of my sister Marty's claim that she met some guy in downtown Flint once riding a horse and wearing a Mexican poncho. I thought it might be some sort of Clint Eastwood fantasy. She even had a name — John Kotarski. Keep in mind that Marty claims she can't remember anything that happened to her before the 9th grade and, at 15, regularly drove the family car to get to her driver's training lessons, which seems slightly illegal, even in a car-loving town like Flint. But Flint Expatriate readers have backed her up on this one. It seems the urban cowboy lived on Avon Street and even had a fictionalized children's story written about him in The Flint Journal. 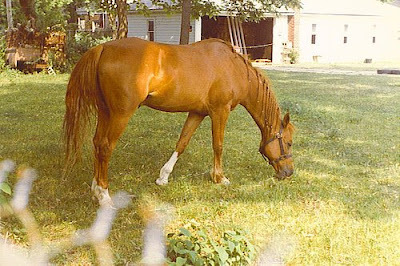 And, as I should have expected, Tom Wirt even has a photo of the horse nibbling grass in a Flint backyard. I find it hilarious that Tom lived next door to the horse, but never met John. I guess when you live in Flint and your neighbor has a horse and a poncho, you just assume he also has a rifle and it's wise not to ask too many questions. So Marty...I apologize for doubting you, but I'm still not buying the story that you smashed up the family station wagon trying to avoid a squirrel in the Powers' parking lot. And John Kotarski...we expect to hear from you soon. "Oh, I knew John Kotarski well, and yes, he was a big East Village character. He did have a horse, boarded via a grandfather clause on Avon Street. In the early 80s I wrote a serial Christmas children's story for the Flint Journal featuring a fictionalized version of Kotarski -- I think I named him Cliff; when the story finished, on Christmas Eve, John and his horse Ali rode through downtown in the Christmas parade. One famous story about him was when he tried riding the horse into Doobie's and was forever after banned. He's now happily married to an Ann Arbor academic. I don't know if he still owns any places in Flint. Yes, he did gut a place on Second Street. Remember when the "sheet people" rolled through town? I had dinner with them in that place on Second Street -- some young lovelies were feeding a long-haired guru brown rice. Really, really strange. John put them up for a couple of weeks. He was a bit loud and overbearing but had a good heart and I was and am fond of him." "Does anyone know anything about a guy named John Kotarski? He was kind of a hippie lawyer (supposedly) who left the profession. 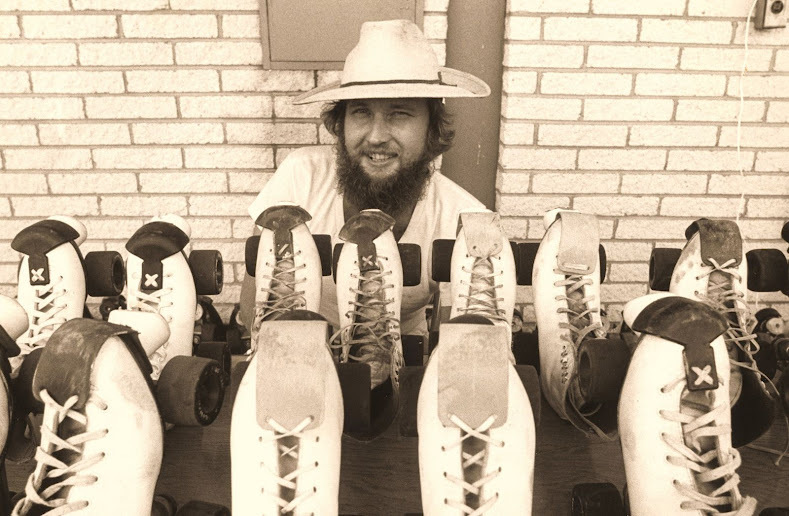 When I met him he had a roller skating rental kiosk in downtown Flint. 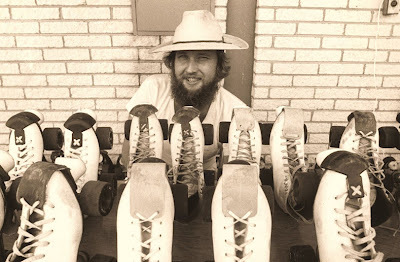 When you rented skates from him he also offered you a glass of wine (whatever). He was quite eccentric and he rode around town on a horse and wore a Mexican poncho and a hemp woven hat. NO...I am not dropping acid! He's a real guy!" John used to drive around in a light blue VW karman ghia, it was not as nice a Amheer Bathish's red one, but more on par with Michael Kennedy's dark blue Fiat Spyder 2000. 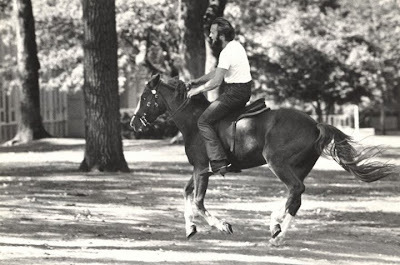 Yes, John used to ride around on his horse and cut a dashing figure through the East Village. 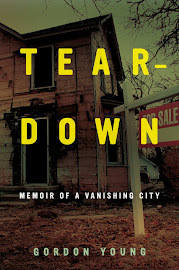 He had many rental properties, and most of them were inhabited by interesting people, so we were all members of a sort of family, a family with a crazy guy at the head about whom we could all commiserate, complain, and kvetch. I remember particularly a dinner party at John's house where the guest of Honor was Matt someone or other, who had once kidnapped the District Attorney in a heavily publicized case, had ended up living in Mexico for a long time and was then being retrained as a pilot as part of Jimmy Carter's retraining program. Lots of wine. Joe, we should get together for an interview sometime over drinks in SF. John is my brother in law, I use to listen to stories about john for hours. His baby brother Mark would go into great detail and I could see that Mark to great care in making sure that I too felt the pride that he felt having such a wonderful brother who always made sure that no matter what others said about him, he would prove his point every time. Right or wrong John always proved to be the king Devils Advocate, even if he didnt agree he would always prove both sides of the story to allow all to be unbiased. It is a shame John would have made an outstanding attorney and would have given younger brother Micheal a run for his money. We love you John and miss you. Mark would have loved this and it would have added to the long list of stories for the kids. Thanks for the photos. It's great to see such a beautiful horse and shots of Flint in all of its seventies glory. I love the legends surrounding John Kotarski, among others. Our fondness for these stories and for our home-grown characters is one of the things that makes Flint so memorable. It's great to see those photos. Somehow, somewhere, I should remember all of this as I lived directly across the street from Kotarski and his horses! If I remember correctly, I even rode them. Unfortunately, this was the early 80's when I was 0-5, so my memory is a little hazy. Can You Do This in Your Buick LeSabre? That's Genesee Towers with an "S"